School is right around the corner (or has already started in some cases! ), and you know what that means…. Dun dun dun- time to start thinking about packing lunches! Making the time to ensure that your child is getting a healthy home-packed lunch every day can be a little daunting, but here are some tricks to help this process become a piece of cake! *Re-use those fruit cups! 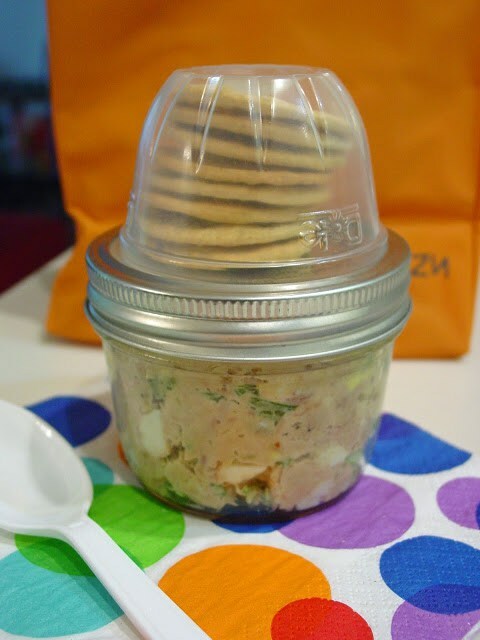 They’ll attache perfectly to a mason jar lid, giving you a convenient little place to store snacks/dips! *Have a prep day! Spend an hour or so as a family preparing food for lunches for the entire week! Chop up veggies, wash and prep fruit, and make a bunch of sandwiches. Doing this one tip will save you tons of stress later! 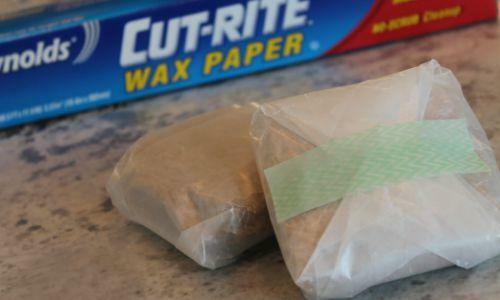 *Wrap your sandwiches in wax paper instead of using a Ziploc bag- this will give them a little “placemat” for their lunch instead of the dirty lunch room table, and you can leave those Ziploc bags for other purposes ;). *If you don’t want to invest in nicer ice packs (or you’re worried about sending those with your kids ;) ), just freeze a sponge in a Ziploc bag for a much cheaper version that will accomplish the same thing! *Utilize the power of the freezer! Whether your sandwiches are PB&J or ham and cheese, you can stick them in the freezer to keep them fresh and when you pull them out in the morning to pack them in your kids’ lunch bags, they’ll be thawed and ready to go by lunchtime! You can do this with cheese sticks, Go-gurts, grapes, etc. This will help keep things fresh and will also keep food cold until lunchtime. 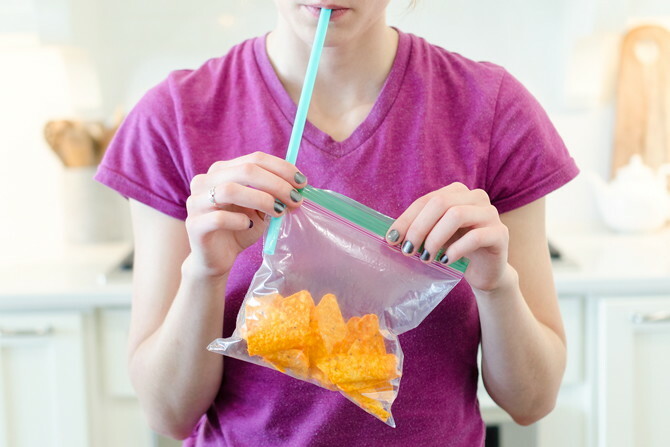 *Use a straw to fill bags of chips with air to keep them from getting crushed. *If your kids need their apples sliced, slice it, put the apple back together and wrap it in Saran wrap or a rubber band to keep them from browning. *Have your kids pack their own lunches! To help them pack balanced lunches, you can create a “Take 1” bucket (with things like fruit snacks, desserts, etc) and a “Take 2” bucket (with things like apples, nuts, carrot sticks, etc) so they still have choices, but you know that it will be a balanced meal ;). You could also create a checklist that allows them to pack one of everything on the list (e.g. sandwich, fruit, veggie, dessert), which again makes sure they are eating a balanced meal, but allows them some flexibility as well! *Take the thinking out of making lunch. Create a list of lunches (you can decide if you just want enough variety for one week, or if you want enough for 2-3), and rotate through the list. This will make meal planning much easier, as well as grocery shopping since you’ll know exactly what to get! *Split bulk food. 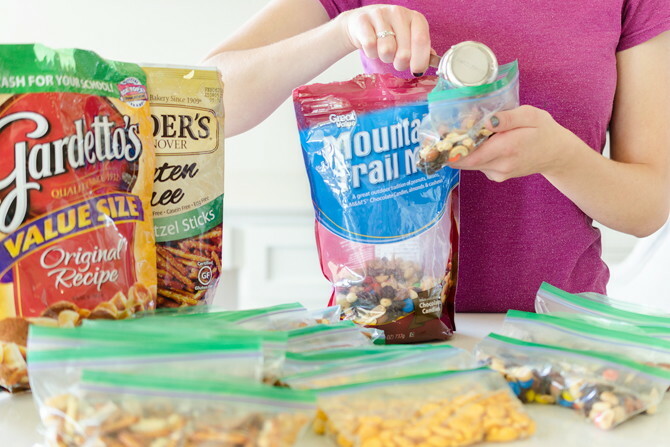 Rather than spend the extra money on packages of individual-sized food items, buy them in bulk and take a couple minutes to split them into snack sized bags- way more cost-effective. *Don’t forget the love notes ;). 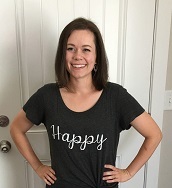 If you have to write some up in advance then do it, but don’t forget to occasionally sneak in a loving reminder to your child that you’re thinking of them and love them, because some days at school can be hard!